The method and opening and closing dates for award applications at the end of the Audax season will be published to members via email and on the Audax Australia website in the awards section. Single season member awards must be applied for online, whereas multi-season awards still require submission of the appropriate application form. This may change from time to time as award application processes are updated. 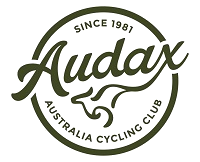 There is no fee for Members of Audax Australia. Subject to any restriction set out in the Award descriptions, a rider may apply for as many awards as their riding record entitles them. The Awards Secretary retains absolute discretion to accept or reject an application for an award, including whether to accept evidence proffered or to determine whether claimed rides are eligible. This may particularly be the case when considering applications from Members with a long history of rides completed when they were living outside Australia. The rides must be completed within a single season and all rides must be BRM. No longer for shorter ride substitutions (although for the purposes of PBP qualification this is allowed). For Members of Audax Australia, the ACP Super Randonneur award can be applied for via the Audax Australia Awards application process. ACP also allow non-members to apply for this award via the Audax Australia International Brevet Secretary (email brevets@audax.org.au). The Randonneur 5000 and Randonneur 10000 awards offered by Audax Club Parisien (refer http://www.audax-club-parisien.com/EN/) must be applied for on the appropriate application form by 31st October each year via the Audax Australia International Brevet Secretary (email brevets@audax.org.au). The International Super Randonneur (ISR) award can be applied for directly at any time via the Les Randonneurs Mondiaux website (refer http://www.randonneursmondiaux.org/).